That bottom cut is a wing-dinger...it made Dave almost pass out when he saw how deep it was. I think she learned her lesson. I think I learned one too. I appreciate that you've put your foot down. I'm sure you've made the right choice. But next year, or the year after - you might consider a bargain. oh man! makes me so sad that a 10 year old would even think they would need to shave, peer pressure is ROUGH! poor little thing, OUCH!!!!!!! I probably would have passed out!!!!!!! Ah this brings back memories! I too decided not to listen to my mom and shaved my legs at 11. I had a huge cut up my leg to my knee. Talk about painful and lots of bleeding. I passed this story on to my daughter and she didn't like it so much. At 13 she did nair and it was 14 when she was shaving, but she prefers the nair and since she is blonde haired it works lovely. It scared me for a good couple years though, and by then I was old enough. Good luck, and thanks for sharing these little mothering moments, they really help me! Oh Gracie, you poor thing. Honestly we have all been there, either as the ten year old or the mum and in my case both. we didnt have any sticking plasters and i remember walking around with bits of tissue stuck to my legs. so hard my nearly 8 yr old keeps asking when she can, she says her legs are hairy ( they are not at all).. soo young!! I think i was 11 when i started, and lots of cuts along the way! This picture makes me want to forego college savings and invest in laser-hair removal for all my daughters. I have a scar from a cut in pretty much the same spot on my leg from my first leg-shaving adventure at, you guess it, 10. I bled so much I thought I was dying. I was at a summer camp and it happened in the showers (what an idiot, I know...). Of course, now I wish I didn't have to shave my legs as often! i still don't shave. guess it's nice to have light asian leg hair. lol. the french don't care much either. armpit hair? let it grow. I still have a huge scar up my entire shin from shaving on my own when I was about 10. As a result, when my daughter turned 10 and wanted to shave I said yes and taught her the right way to do it. My husband reminds me all the time that we need to say yes to our kids when we can because we want our "no" answers to hold weight when it comes to the really big things. Hope those "owies" heal quickly!!! The question of the day is, what age is "right?" I know we all have to decide for ourselves, but in our family, having daughters 2.5 years apart is harder than I thought. Our 12 year old hasn't shaved and is just asking, but doesn't really need to. Our 9.5 year old wants to and is seriously very hairy but I've told her not yet. How can I be fair? Ahhh--I'm an only daughter with four brothers. I just don't get this sister/fairness stuff sometimes! What would you do? Does it have to be an "age" or should I just let the younger do it earlier than the first since it's going to bother her soon? Ouch! I did the EXACT same thing when I was 11! 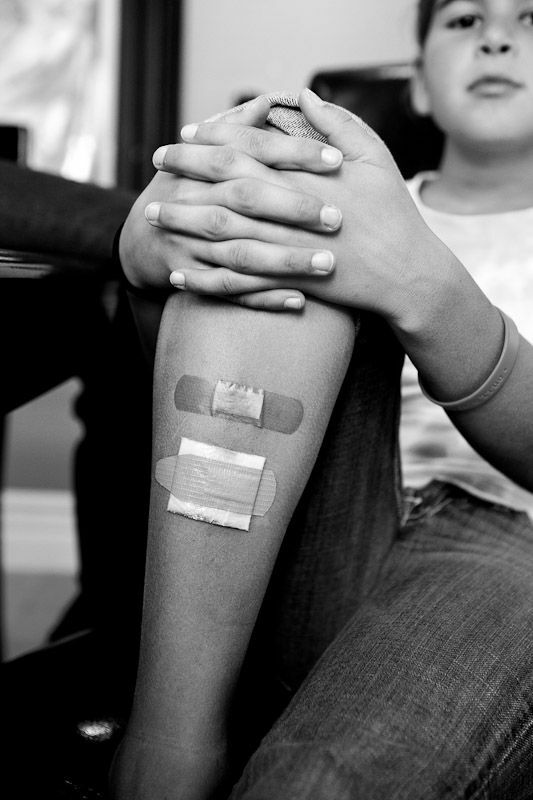 I was too ashamed to tell my mom, though, so I bandaged all those cuts myself and told her I had falled off my bike. Why shave? wax is so much better! hair will become thiner and thiner. Excuse my poor english, I'm french (and no, french girls and french women don't "let it grow"!). i would love to know your "why". one of my daughters has lots of really black hair on her legs. i was the same way and remember being made fun of by the boys when i was around 10 or 11. one boy also liked to call me "little miss mustache"....before i discovered jolie hair bleach and a few years later, wax! i was humiliated. i hope my daughter doesn't have the same experience but what if she does? do i let her shave? take her to get her upper lip waxed? what age is appropriate? what if they are getting made fun of? My daughter is 8 so I'm not there yet- but I did just order The American Girl book, The Care and Keeping of You. Does that touch on shaving? I hope so! I did the same thing when I first shaved. I decided to do it right before I went babysitting and didn't give myself nearly enough time and ended up with a large chunk out of my leg! Ouch. I too have a scar from where I shaved incorrectly when I wasn't supposed too. Sometimes you just have to learn the hard way! Agreed, what is your "why" on this one? Does a 10 year old really believe the, "because you have to do it forever" line? I worry mine will say, "good, I want to do it forever!" Is it wrong to use peer pressure for leverage to go my way?!! Also, if Elle does a cake float, and Lu does a campout for bday traditions, what are the traditions of your other kids? Once upon a time, I did that too. I think I was about 12 though. I had just started shaving my legs. It was also right along the shin bone and it was a doozie!! Ouch! My daughter is 11 and I am glad she has not brought up shaving yet. When she is ready to shave, I will tell her that she does not need to shave her upper legs. I did and I regret it! My 10 year old just asked me about this last week and I said no, too. Thanks for the visual aid that I can use to back up one of my reasons. Let me just say I got a huge laugh out of this and before you think, "What a jerk, why is this funny?" let me explain. I now have a lovely scar down the front of my left shin from doing the exact same thing when I was about 8 or 9 years old. However, when my mother came in to check on me the bath water was red and there was a piece of skin hanging from the razor. How's that for giving someone something to pass out at? Sorry...TMI. maybe an electric razor is the best option for the young ones? My mom had us start with that on the calves only about age 10 or 11? We still had plenty of scars from our teens. Ugh! Oh... I did exactly the same thing at about 13. I used a huge, old and VERY sharp mens razor and did it in secret... and cut myself several times so deep that I actually scarred my legs for quite a few years. Make sure you get out the vitamin e cream to minimise the scars! A hard but good lesson to learn. That photo is priceless! that is a classic picture! Ran in to your blog this week and just wanted to let you know what a delight it is to me. I found you after I saw your clip on Mormon.org. Coincidentally I have a son Max and 4 daughters too. Max is also our oldest. My oldest daughter, Mara, passed away from brain cancer 3 years ago. Thank you for sharing your family with strangers like me! Poor Grace, I bet that was painful. Yes - I can add my name to the list of young girls who had a shaving scar that lasted a few years! The first time I shaved I was at a friends place (behind my mums back)....I've just started reading your blog all the way from AUSTRALIA. My sister put me onto you - looking forward to seeing you next year for the power of mums retreat. I was also 10 when I tried to shave my legs in secret before school one morning. I was dressed in my uniform and my brother came in to find me with the razor going down my leg.... he politely informed me that I needed to go up my leg in order to shave the hair off. I proceeded to DRY shave my leg (how uninformed was I!!!) and my mother walked in... my brother had gone and told her after he gave me that great advice!! After a big talk from my mum, I was sent to school with one calf half shaved! Oh the embarrassment! She got cut cause she didn't know how to do it. I don't think it's pressure. I needed to shave at 9 but didn't until 10. It was dark hair and thick. I wasn't allowed to do above the knee. So I looked like a half shaved gorilla in a bathing suit and it was uncomfortable. Don't shave legs for a week with really thick dark hard hair and it's easy to see it is bothersome against long pants, even pj's. Skin was easy to dry out and more itchy the longer the hair is. One thing she did to make sure I wouldn't cut myself is get me an electric shaver. I, too, definitely did the same thing when I was 11. I remember thinking I had to press the razor really hard against my skin...ouch, bad idea. I was so embarrassed to show my mom! Ohhh I did that too, when I was a teenager. I don't think I've ever put any real strength into shaving my legs since, It gave me shivers when I read that first line! Mumma knows best. I still have a scar!!! Like a whole slice of skin straight up my shin. That sweet little girl. ouch! been there myself and still remember it! oh and then I decided to shave off the hair on my arms too! I started shaving at 12. I think I started because I was getting underarm hair and the legs got included too. there were a few scraps and cuts, but my mom helped me out. I did have friends who did it in secret when they were younger (they had darker hair and were embarrassed). They were sooo worried their mothers would find out! The best thing is for the kid to ask you first and you sit and explain why you may be for it or against it.